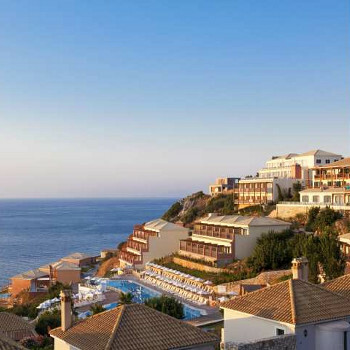 The Louis Apostolata Hotel is set on a hillside with some amazing views. Their rooms are well equipped and also have heat and air-conditioning. There are 2 restaurants, 3 bars and a swimming pool. 2 km from the hotel is the villa of Skala and a just further 1 km is beach. We stayed at this Hotel in June 2004. We had paid extra for a sea view which when we got there consisted of a view of a bush. Plus water from the balcony of the room above when they had their air conditioning on. We were not impressed with the "Superior" room (also at exra cost) no bath and it came to a head after a few days when water dripped through the ceiling during the night onto a single bed which was shoved in a corner. We reported this to our "stand in" rep and the Reception desk. After 4 days we were offered an alternative room, when I said could we move in a couple of hours as we were meeting friends for lunch I was asked "Dont you want the room then" so we had to move then and there. The food was very basic for a 4 star hotel - the same lunch time and evening with the all inclusive wine from a barrel. The hotel was advertised in the Olympic select brochure but was nowhere near 4*. The hotel was quite isolated and a taxi drive away from the nearest town of Scala. No entertainment but the European Cup was broadcast on the large screen TV and great excitment ensued when Greece won. We would not go back. It is not the first time we have been disappointed in a hotel in the Louis group.